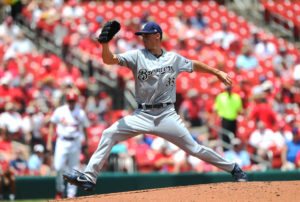 Brent Suter allowed just two hits and two runs over seven innings as the Brewers drubbed the Cardinals 11-3 in Milwaukee. Eric Thames contributed a bases-clearing triple and Manny Pina homered for Milwaukee. The Brewers lead the Cubs by one game in the NL Central at 44-and-30, after the Cubs lost to the Cincinnati Reds Thursday night. Carlos Martinez was the losing pitcher, giving up seven runs in four innings. Matt Carpenter led off the game with a first-pitch home run for St. Louis, his fourth in the last five games. This was the second consecutive start where Suter has gone seven innings, and is now 8-4 on the season. The Cardinals are 2-and-7 in their last nine. The second game of the series is Friday at Miller Park. Junior Guerra throws against Jack Flaherty.